In Windows 7 Comes To Wors World I documented my experiences with installing and beginning to use Windows 7 RC. Basically, I upgraded Vista Business to W7 *is that how we’re going to short hand Windows 7???) and ran up a few applications and utilities to see what worked and what didn’t. 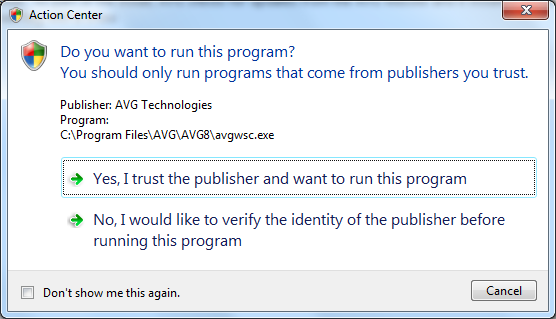 One of the applications I seemed to have an issue with was AVG. 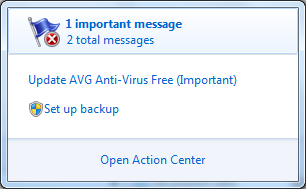 I already had AVG 8.5 Free installed but I thought I’d try removing it and reinstalling the latest version available here. Hhhm! Does this mean that the AVG app has not been updated or that the PC Issues app doesn’t recognize that the app has updated? Who knows? All I know is that when I ran a scan this time the resident shield service kept on “shielding” and didn’t chuck an error this time. Hopefully that means that another reason to not move to W7 on my main laptop has been removed for me. This entry was posted on June 11, 2009 at 23:11 and filed under Computers and Internet. You can follow any responses to this entry through the RSS feed. You can leave a response, or trackback from your own site.